In the Gout Air Pouch Model, injection of monosodium urate crystals (MSU) into the air pouch activates infiltration and differentiation of cells associated with the inflammatory response and a concurrent increase in exudate volume. Both readouts are convenient and reliable for assessment of compound efficacy - differential cell analysis and exudate volume. The convenience and reliability derive from the large volumes of inflammatory exudates that can be collected and characterized with ease - unlike the very challenging collection of small volumes of joint synovial fluid available from rodents. MSU crystals drive the inflammatory response by binding a myriad of proteins from immunoglobulins to complement. The crystal surface is a site of dynamic protein exchange in which the make-up of the bound proteins reflects the progression of the inflammatory response. Development of an air pouch provides a cavity in which the inflammatory response may be studied. The 7-day development of the air pouch leads to a pouch lining of granulation tissue consisting mainly of fibroblasts, macrophage and mast cells (2) - a surface morphologically similar to the synovium in joints (3) and, therefore, an excellent surface for the effects of inflammation on the joints. 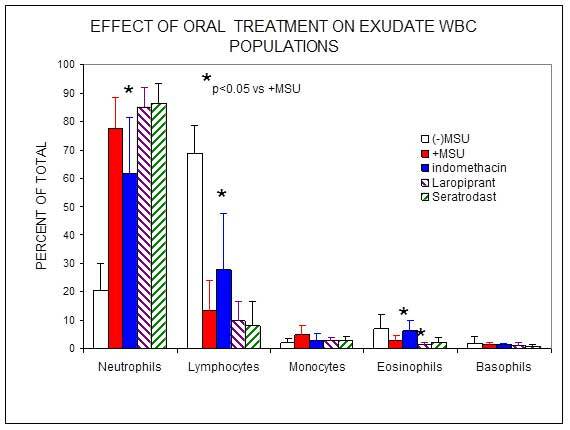 In the WBI Gout Model, well characterized MSU crystals provide a reproducible disease agent that gives a quantifiable inflammatory response as measured by exudate volume and differential cell counts. MSU stimulation of the inflammatory cascade is associated with activation of mononuclear phagocytes leading to a host of proinflammatory mediators such as IL-1beta, TNF-alpha, IL-6 and IL-8 as well as recruitment of inflammatory monocytes and neutrophils into the joint synovium. Histological examination of the pouch lining is another valuable readout providing visual (photomicrograph) evidence of a protective effect of a test compound. The histology includes a pathologist report. 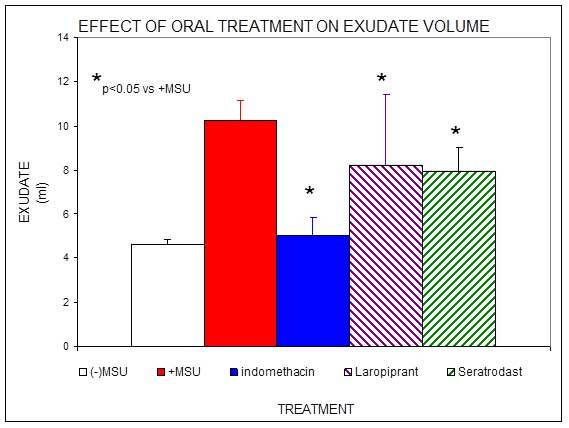 This is an optional item the Client may decide to order after review of the basic study results - exudate volume and differential cell analysis. 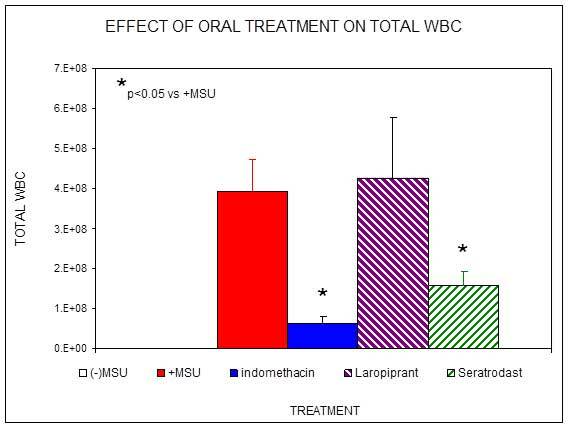 In any MSU Air Pouch study at WBI, the air pouch lining is collected and preserved at termination of the study so these samples are available for histology. The convenience and reliability derive from the large volumes of inflammatory exudates that can be collected and characterized with ease.